One of my passion is teaching and coaching photography. I enjoy taking great pictures, winning awards and inspiring people all over the world. However, I enjoy it MORE when my students can do them better than I do. Here you'll find all the products and services that I have created to help people learn photography more effectively with more fun! 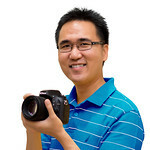 Want to start learning photography but don't know what equipments you should buy? Given the vast amount of options out there, how do you know which one is the right one for you? You could waste time reading hundreds of review articles out there but still end up buying the wrong equipments and wasting your money. To get exactly what you need, you need an expert who will take a detailed look of your requirements one by one and give you a thorough recommendations. How far you've gotten in your photography? Are your pictures good enough? What can be improved from your photographs? These are some questions that will get answered in this one on one portfolio review session. Submit 20 of your portfolio images and I will give you specific recommendations on what to improve at each photographs.